Weatherhead Music is the home stop for private music lessons with TeJay or Ashley Rogers. 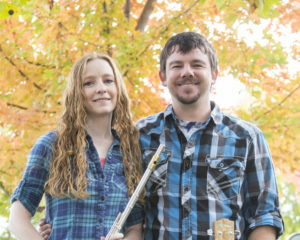 Ashley teaches flute lessons and TeJay teaches guitar, ukulele and banjo lessons. They both teach at the Meridian Music and Arts facility in Meridian, Idaho. How we got here Weatherhead Music started out with guitar lessons in a small shed behind TeJay’s and Ashley’s home in Emmett, Idaho. Over the years the teaching locations have wondered around the Treasure valley including places like Hartz Music (Meridian), Arts West (Eagle), Dunkley Music (Boise), etc. In early 2011 TeJay teamed up with some local music teacher to form Meridian Music and Arts, LLC with the idea of providing a better place for music teachers to teach. Meridian Music and Arts is now the full time home of the Weatherhead Music lesson studio. We teach flute, guitar, ukulele, and banjo lessons to students of all ages and levels. If you’re interested in lessons please contact us to get signed up!